Here are some examples of Movie Title sequences. Even though they are not strictly Kinetic Type, which our final projects will be, the use of typeography and motion is useful to look at. The sequence for Fight Club is a lot faster and video orientated, utilising a moving background with overlaying text, where as Sin City’s sequence is all done digitally with a comic book feel to relate it back to its origins as a graphic novel. Both sequences contrast massively in look and style, yet both work extremely well for their intended impact. This site has got some pretty cool bits nd bobs to play around with, most notably the Spyrographer. All these use code to generate the graphics and are good examples for the advanced web desin unit. Here are a list of sites and videos with examples of the technologies we are looking at for the Touch the Sky project. Some are more relevant than others but all have their individual influence. As part of one of our units this year we are required to think of the next level in Sky Interactive home entertainment, using technologies not readily available in todays market. My idea uses multi touch tracking to get rid of standard tv controllers, enabling the user to control all elements of the TV using just their hands within a set 3D space. This will also be translated in a social networking format, like facebook and myspace, where users will be able to add channels as friends and download and save audio/visual files within their profiles. Different users within a household will have different profiles to personalise their own space. Interactive elements will be incorporated as programs are being watched, such as colouring in/join the dots/play along musical instruments for children’s programs etc. Im looking forward to pitching the idea as I feel it could well actually be the next step in home viewing. The easiest way to demonstrate this application is to watch the explanation given by the creater, Anand Agarawala at http://bumptop.com/. 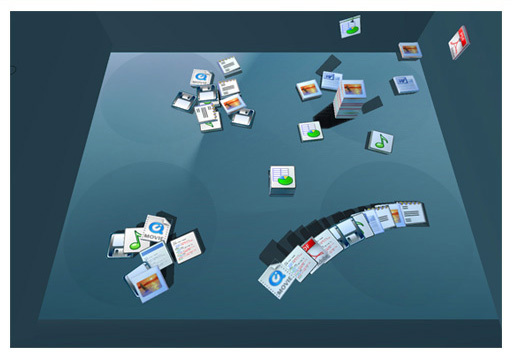 The idea utilises a 3D desktop environment instead of a 2 dimentional work area. I love the idea but don’t like the interface they use. It needs to be more attractive and easy to use, so easy anyone can use it. Ill be interested to see where this idea ends up.